Our field equipment includes research vessels, acoustic telemetry receivers and a state of the art electrofishing unit for both bank and boatmounted applications. 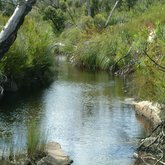 This project focuses on filling knowledge gaps relating to the ecology of three of south-western Australia’s most threatened freshwater fishes, Trout Minnow, Balston’s Pygmy Perch and the Little Pygmy Perch, that will aid in their conservation. This will include establishing the distribution of each species, as well as determining the migration patterns in different systems and the areas critical to their survival, such as spawning habitats, larval nursery areas and summer refuges. Population estimates will be assessed for several populations using telemetry and developing photo-identification for the Trout Minnow. A full risk analysis will be implemented for each species including; water quality, salinity, changed extraction practices, impacts of feral fish, in-stream barriers and climate change. The above data will enable prioritisation and preparation for on-ground works to riparian zones and in-stream barriers. This information will also aid in assessing and implementing appropriate management arrangements to protect these rare species and their habitat. This is an ongoing study involving monitoring of fish communities in response to river restoration initiatives. The Glenelg River, in southwestern Victoria, is impacted by flow alteration, salinisation and excessive sedimentation. This project is part of a longer term monitoring program to assess effectiveness of environmental water releases and in stream habitat restoration (sand extraction and large woody debris input) toward achieving ecological targets. Fishing Framework for Assessing River and Wetland Health (FARWH) in the wet/dry topics of Australia. Permanent waterholes in intermittent rivers of northern Australia provide dry-season refugia for a diverse piscifauna and are popular areas for customary and recreational fishing. During research undertaken in the Fitzroy River catchment (northern Western Australia) aimed at quantifying ecological condition (National Water Commission Project Framework for River and Wetland Health), we investigated the effects of recreational and customary (or Indigenous) fish harvest from isolated dry-season waterholes. Due to the remoteness of the region and land tenure, access to the river is difficult, such that visitation rates are highest in areas near public roads and population centres. The abundance of targeted species decreased in areas that were easily accessible and therefore subjected to increased fishing pressure. We estimated that only 38% of river length remains subject to relatively low fishing pressure and that the effect of high fishing pressure on the long-term persistence of local populations is likely to be greatest for non migratory species that rely on local recruitment, and become more apparent with increasing distance from potential recolonisation sources. Movement and dynamics of Black Bream in hypersaline estuaries. In south western Australia, the influence of unnaturally high catchment salinities on estuarine fish stocks is a growing concern for fisheries management. The lower reaches of many estuaries and lagoons on the south coast of Western Australia have become hypersaline resulting in the periodic occurrence of massive fish mortalities. We investigated the influence of hypersaline events on the movement dynamics of Black Bream using acoustic telemetry. High resolution time-integrated movements were recorded for 25 individual fish and these data highlighted the importance of lower salinity habitats in upper reaches of the estuary as refugia during periods of hypersalinity. The preferential use of upper estuarine areas suggests there are critical times, during hypersaline conditions, when fish populations will be susceptible to a range of additional stressors. Inclusion of these considerations may be an important addition to a more holistic management approach that combines traditional regulations with the more adaptive management of catch rates, timing and location.